t’s like the Super Bowl is still going on. Since the hallowed field goal by Friday’s top newsmaker, things continue to look up for the World Champion Patriots. At the very least, everything that the Patriots wanted to do, they have done. And some good things that they didn’t expect to happened also. Such as life when you are at the top of the heap. Suddenly, everyone wants to come play or just stay. Having CMGi Field on the horizon was supposed to give the team a lift in this area anyway. But toss a Vince into the mix, and you have a terrific recipe for sustained success that no concoction of Jambalaya can top. Adam Vinatieri lifted all Patriot hearts today, much the same way he did a month and a half ago. The plucky Patriot kicker booted the championship field goal in the Big Easy, and today helped the Patriots boot the franchise tag off of him. He signed a three-year contract today, on the last day that the Patriots could remove the franchise tag and use it on someone else, which the team did not need to do. Had Vinatieri not signed today, he would have made $1.24 million in 2002 and would not have been able to negotiate with the Patriots again for two months. But Vinatieri will be staying around for a while, presumably for more money than the franchise price would have brought. Despite not being a good kicker on kickoffs, his penchant for money field goals more than makes up for his inability to get lots of touchbacks. The Patriots now have a veteran kicker for the next three years who they know can make any pressure kick that he needs to. Signing Vinatieri was one of the offseason priorities for the Patriots, and that list, college draft excluded, is nearing completion. Everything thus far has come up aces for the Patriots, and the organization is drawing more praise for continuing the very strategies that made them Super Bowl champs in the first place. Right off the bat, offensive coordinator Charlie Weis was re-signed at a profit as hefty as his waistline. Now that all head coaching vacancies have been locked up (Oakland finally named offensive coordinator Bill Callahan as Jon Gruden’s replacement this week), Weis won’t go somewhere else in 2002. He was rumoured to be on the short list of coaching vacancies at Carolina and Tampa Bay. But Weis will remain, and the top three of Weis, Bill Belichick and Romeo Crennel will remain intact for the next year. Matter of fact, the entire coaching staff will return for ’02. With a year of tutoring Tom Brady under his belt, Weis might work on opening up the Patriot offense a bit next year. In 2001, Weis seemed to produce only enough offense necessary to win the game, something that perhaps came from Belichick. If given the chance, Brady can put up huge numbers (San Diego, Indianapolis, New Orleans, Oakland). Weis needs to give Brady more chances like that in 2001. And with Antowain Smith hanging around for (gulp) five more years, the running attack will remain intact to help aid the passing game. The Patriots avoided the Curtis Martin mistake by extending a literal right hand of fellowship to a powerful back who dearly wanted to stay. Smith spurned a possible offer to return to his Houston hometown and play for the expansion Texans. It is a feel-good story, with presumably a happy ending for both sides. Whether five years is too long matters not in 2002, and perhaps ever. Like most contracts of this length, it is backloaded heavily. Over two-thirds of his $12 million contract kicks in in years four and five. By then, Smith will either be ready to be released or reworked. The Patriots, in typical Patriot fashion, got their man on their terms, and the player is thrilled to death in the process. The Patriots put Willie McGinest and Ted Johnson on the expansion draft list. Neither player was claimed by Houston. The Patriots figured to keep McGinest after reworking his contract, and expected to lose Johnson who wanted to get more playing time elsewhere. Unexpectedly, they managed to keep both, and again, on the team’s terms. McGinest is 30 years old, and is deeply attached to the organization. Winning the Super Bowl was critical to McGinest’s desire to stay, who seems to cry at championships as much as his former teammate Martin did (that’s D-I-D). McGinest, who may seem hell-bent on spending the rest of his career making up for his holding call on Marshall Faulk, agreed almost immediately to a new deal that reduced his cap hit by around $2 million. If he can stay injury-free, he is still an effective pass rusher, as Kurt Warner will attest to. Johnson was another story. He agreed to a re-do last year, and wanted to leave the Patriots rather than take another hit. His reduced playing time was also a factor, in that he wanted to go somewhere where he could start once again. The Patriots scored big points by leveling with Johnson, and did the proverbial “if you love something, set it free” deal. So what happens? Green Bay makes an offer, but the Patriots’ offer is better. Johnson stays and thanks the Patriots for their honesty. The Patriots knock another two megs off their salary cap, can now worry less about their linebacker depth, and can worry even less if they re-sign their one remaining free agent question mark, Roman Phifer. The Patriots want him back, and the only thing that will prevent Phifer from re-signing is the desire to stay home in California. Speaking of Green Bay, the Packers did the Patriots a big favor by taking Terry Glenn off of their hands. And given the way that situation worked out, it’s a wonder that the Packers allowed the Patriots to come out of it smelling so sweet. It’s also a wonder that such an impeccable organization as the Packers would assume the responsibility of the AFC’s biggest man-child, the conference’s answer to Randy Moss. For Glenn to be traded to the Packers, it was a lot like the last five weeks of the 2001 season for the Patriots. 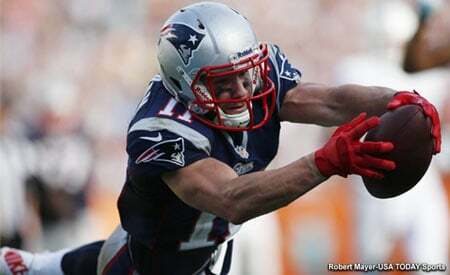 Ten or eleven things needed to break just right for the Patriots, and all ten or eleven did. From dropped appeals to dropped asking prices to dropped Patriot salary cap figures, you name it, it benefitted the Patriots. The Patriots received a fourth-round draft pick for 2002 and a conditional pick for 2003. If anyone thought that the fourth-round pick was too small a return for a player of Glenn’s talents, God forbid if Glenn had won any of his appeals. The Patriots would have been on the hook for a ton of money and Glenn would have been untradeable. So now, the team has a little depth problem at wide receiver. By losing Matt Stevens and perhaps eventually Brandon Mitchell to Houston, safety and defensive line are a little thin right now. Gee, Patriots, got a fix for this? No prob. Just go out and sign three key free agents, cut from the same jib as their glittering 2001 haul. Donald Hayes comes to the Patriots from Carolina (sort of like Jason Giambi joining the team that laid the last loss on his old team) with a reputation as an “inexpensive Keyshawn Johnson”. He’s a six-foot-four big receiver who will probably step right in and start (and bump David Patten to Troy Brown’s old slot receiver spot). Chris Hayes (no relation) comes over from the Jets and becomes Tebucky Jones’ new backup at free safety, and will join Jones and Larry Izzo as special teams bombardiers. And Rick Lyle will head up I-95 with Chris Hayes to re-join Belichick and move into a starting defensive tackle position. Take away Richard Seymour, and the remaining Patriot defensive linemen are all ex-Jets. So, what’s left? Sign Phifer, trade Drew Bledsoe, draft smart, and perhaps get Brady locked up for a few years. The Bledsoe front is rather stagnant, with a smaller market than anyone on the Patriots predicted. The Patriots are in no real hurry to deal Bledsoe, except that it would be nice if a deal could be done prior to the draft in April. Prime targets like Washington, Chicago and Seattle aren’t really in the mix anymore, and Cincinnati remains the strongest possibility at the moment. But nothing is imminent, and the Patriots really don’t need to make a deal at this time. If anything has broken against the Patriots, it is the work being done by the Patriots’ divisional opponents. Miami has obtained running back Ricky Williams from New Orleans, he of the NCAA career rushing record and who Mike Ditka once traded a whole draft to obtain draft rights to. Buffalo picked up linebacker London Fletcher from the Rams to help offset the loss of Sam Cowart. Where did Cowart wind up? The Jets, of course. However, the Jets had to dump a ton of salary, and lost both their starting cornerbacks and their starting right tackle to Houston. More changes may be in store for the men in green. The great Patriot engine keeps purring like a kitten. Steady as she goes, and full speed ahead. Who knows. Maybe Bledsoe will soon call a press conference, regarding his “change of heart”, and “acceptance of his backup role”. The way things have been going for the Patriots, anything is possible. This entry was posted in 2002 Patriots Offseason on March 16, 2002 by Bob George.